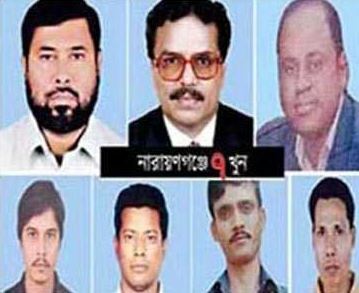 Prime accused Nur Hossain, sacked Rab-11 commanding officer Tareque Sayeed Mohammad and 24 others were awarded death penalty in Narayanganj 7 murder case. – 26 including Nur Hossain, 3 ex-Rab-11 officials get death penalty. – 9 others jailed for various terms. 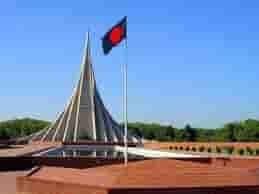 Nur Hossain, Tareque Sayeed Mohammad, Mizanur Rahman Dipu, Abdul Alim, Mohinuddin Munshi, Lans Nayek Hira Miah, Sipahi Abu Toiyob, Selim, Sanaullah Sana, Shah Jahan, Jamal Uddin, Asad-uj-jaman Noor, Purnendu Bala, ROG Arif Hossain, Al Amin, Tajul Islam, Enamul, Belal Hossain, Shihab Uddin, Mortuja Jaman Churchill, Ali Mohammad, Abul Basher, Raham Ali, Emdadul Haque. Ruhul Amin, Soinik Nuruzzaman, SI Abul Kalam Azad, Babul Hasan, SI Kamal Hosen and Constable Habibur Rahman Habib. Murders in Narayanganj isa very boom news in bangladesh. The probe body headed by Additional Secretary will question Narayanganj MP Shamim Osma and Narayanganj Mayor Dr. Ivy Rahman on August 11, 2014 and August 12 at Bangladesh Secretariat Bhaban in Dhaka, Bangladesh. The Probe committee have questioned 356 people including former Rab CEO Lt Col Tarque Sayeed Mohammad, Major Arif Hossain and Lt Com SM Masu Rana, the check of Probe committee said to the Independent. The probe committee will submit report to the High Court by 1st week of September 2014. 7 member probe team heading by Shahjahan Ali Mollah, Additional Secretary of Minitry of Public Administration will quiz 2 Rab men are Abdus Salam deputy Assistant Director or RAB 11 and a member Abdus Salam. in Narayanganj Circuit House. Panel Mayor of Narayan­ganj City corporation Nazrul Islam, his 4 assistants Swapan, Tajul Islam, Liton and Jahangir; advocate Chandan Sarkar and his Driver Ibrahim were abducted and killed near KS Osman Ali Stadium of Fatullah, Narayan­ganj on 27 April 2014. After 3 days, 6 bodies were found floating in the Shitalakkya river. The government formed a 7-members committee to investigate the 7-murder case. The committee headed by Md Shahjahan Ali Mollah, additional secretary at the Public Administration Ministry started work on the Narayan­ganj abduction and killing case. About murders in Narayanganj On May 4, Nazrul father in law Shahid Islam alleged that RAB men had killed Nazrul and others in exchange for Taka 6 crores. He said that Nur Hossain, ward-4 Councilor is the prime suspect in the Nazrul Islam abduction and killing. Shahidul Chairman claims a powerful Awami league lawmaker son brokered the deal with some RAB men to kill Nazul for Tk. 6 crors on behalf of Nur Hossain. The informer, an ally of Nur Hossain, said to Shahidul Islam that the murder deal was finalized in a meeting a week before the abduction and killing. The agent who also maintains close links with Nazrul’s Father in law Shahidul Islam, claimed he was at the meeting. 4 days before the abduction, the agent informed Shahidul Islam of the incident and asked him to send son in law Nazrul into hiding. Nazrul was already getting death threats and was already staying outside his house for over 2 months. According to Nazrul agent, Nur Hossain, Haji Yasin and Hasmat Ali, three top accused in the case, held the meeting. Nur Hossain was the main planner in the case of Narayan­ganj abduction and killing. Nazrul said that he and her daughter Selina, also went to Fatullah Police Station to file a case against Rab top officials but the police refused to take the case. The next day, Selina filled an abduction case against Nur Hossain, Haji Yasin Mia, Hasmat Ali, Aminul Islam, Anwar and Iqbal Hossain. Salina alleged that Nur Hossain abducted her husband over a dispute centering on construction of a road in Mijmiji area 2 months ago. The abduction and killing case was accepted by the police later. On May 11, the High court ordered Government to arrest the 3 RAB officials are Lt. Col. Tareque Sayed Mahammad, Major Arif Hossain and Lt. Commander S.M. 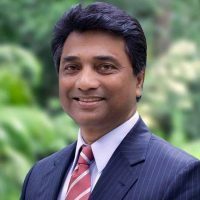 Masud Rana. Tareque is the son-in-law of Mofazal Hossain Chodhury Maya, Minister for Disaster Management and Relief. The HC bench of Justice Mirza Hussain Haider and Justice Muhammad Khurshid Alam Sarkar’s order came up after hearing the petition and the argument with jurist Dr. Dr Kamal Hossain, a councelor of the petition. 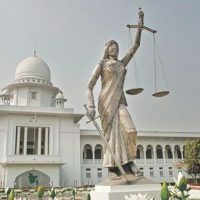 The petitioners are Bijoy Kumar Paul, son in law of Advocate Chandan Sarker, advocate Mahbubur Rahman Ismail, executive president of “Amra Narayan­ganjbashi,” and advocate Sakhawat Hossain Khan, president of Narayan­ganj Bar Association. HC order came after the Authority dismissed the top 3 official of RAB for Narayan­ganj abduction and killing as a pre-planned by Nur Hossain. All cops of Fatullah and Siddhirganj police stations and Detective Branch (DB) members of the district have been transferred to have an impartial investigation. Panel mayor Nazrul Islam and his four aide’s residence are under Siddhirganj Police Station. Prime accused Nur Hossain is also under Siddhirganj Police Station. The abduction spot, near Khan Shaheb Osman Ali Stadium is under Fatullah Police Station. The National Human Right commission (NHRC) Chairman Mizanur Rahman said that the Law enforcers started their first drive one week after the abduction and murder. He said that 7 days are enough for anyone to go from one end of the world to another and its possible to destroy all evidence within several hours, and a week is more than enough to do that. “Why the criminals were they given such a long recess?” he questioned. Nur Hossian and his associates already hidden to India. Lawyers of Narayan­ganj Bar Association observed a one and half an hour token hunger strike at Narayan­ganj District Judge’s Court area demanding arrest of the killers. Noted jurist Dr Kamal Hossain attended it. Primie Minister directed the law enforcement agencies to act quickly for identifying and arresting the culprits through proper investigation. The Prime Minister Sheikh Hasina met victim’s family members at Gonobhaba on May 11, 2014. She said that her government would try and punish the culprits. On May 13, BNP Chairperson Begum Khaleada Zia has visited the family members of 7-killed persons in Narayan­ganj. Khaleda demanded immediate arrest of the killers. Earlier Narayan­ganj city corporation denied to give permission to BNP to hold a rally in Narayan­ganj to protest Narayan­ganj abduction and murder by Nur Hossain and RAB officers..
People of Narayan­ganj on the Dhaka – Chittagong High way and Narayan­ganj link road to protest Abduction and Killing. Police arrested accused ex-RAB officials in connection with Narayan­ganj abduction and killing. Police arrested 2 ex-RAB top official former Lt. Col. Tarek Sayeed Mohammad, also ex-CO of RAB-11 and former Maj Arif Hossain from Dhaka Cantonment with the help of cantonment police at 4 am Saturday on May 17, 2014. Police arrested 3rd ex-RAB official former Lt Commander MM Rana from Dhaka cantonment area at 1:30 am, Sunday on May 18, 2014. A mobile phone conversation between AL Law maker Shamim Osman and prime suspect of Narayan­ganj 7-murders Nur Hossain has aired on different private TVs. Shamim Osman and Nur Hossain conversation tool place 2 days after the abduction. Nur Hossain, word-4 councilor of Narayan­ganj, made a mobile call to Shamim Osman GP number from his airtel number on April 29. During the conversation Nur Hossain was in the Dhanmondi Road no. 4. Father in law of Nazrul Islam claims that Shamim Osman never involve with flee of Nur Hossain to India. Police arrested Narayan­ganj 7-murders prime accused Nur Hossain’s girlfriend Jannatul Ferdous Neela on Sunday 25 May from her Siddirganj house in another murder case. Neela is a supporter of Ruling Awami League and Noor Hossain was Vice president of Siddirganj Thana Awami League but he was expelled from the party after he was accused in the Narayan­ganj killing. Nur Hossain left the country through the Benapole India-Bangladesh border on may 2, 2014 night. RAB said Nur Hossain was in Kolkata in India but his presence is now uncertain. Nur Hossain (50) became a millionaire from a track helper. He joined Al in 2000. Last many years, Nur Hossain Control Sand, Stone trades on the bank of Shitalakkhya River. Nur Hossain setup a Jatra Pandel in Shimrail of Siddirganj, Narayan­ganj. He earned millions of Taka every day from the Jatra Pandel. This the place where most of unsocial activities has been happened last 5 to 7 years. Some reports say that Nur Hossain also was involved in illegal drag business. Bangladesh Police wanted the help of Interpol for the detention of Nur Hossain, the prime accused in the abduction and killing case in Narayan­ganj. The France-based international organization of police (Interpol) has included Nur Hossain’s profile on its “Red Warrant” page of wanted persons. Nur Hossain ordered to Killed them near Kanchpur bridge ! After abduction, 7 victims were given drugs to make unconscious then taken them to Narsingdi district. In the evening, panel mayor Nazrul Islam and six others were brought to Nur Hossain’s sand business area, near Kanchpur bridge and killed them at night. The bodies were taken by trawler to Kalagachhia of Bandar upazila then through them into the Shitalakkhya River. Former RAB official Major Arif Hossain made confessional statement before the court on June 5, 2014. Arif Hossain gave his statement under section 164 of code of criminal procedure before the court of Senior Judicial Magistrate in Narayan­ganj M. Mohiuddin. Prime accused of Narayan­ganj 7 Murders case Nur Hossain was arrested in Kolkata near Netaji Subhas Chandra Bose International Airport on 14 June 2014. Kolkata Police arrested two of his aides are Zahidul Zaman & Selim Bidhan also. Police recovered a revolver, many unauthorized sim cards and a laptop from the Indraprastha apartment complex near Kolkata. A court in Barasat area of West Bengal placed Nur Hossain and his 2 assistance on 8 days police remand. Earlier Police filed a case against Nur Hossain and his associates in Baguiati Police Station on charge of infiltration, possessing firearms and gambling. State Minister for Home Azadduzzamn Khan confirmed about Nur Hossain arrest in Kolkata, India. The Kolkata police arrested him as Bangladesh Police earlier requested to Interpol to arrest Nur Hossain. 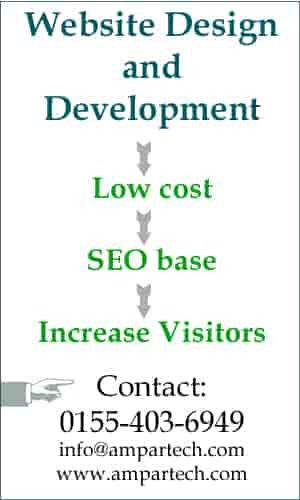 Bangladesh govt. took initiatives to bring back Nur Hossain. Ex-RAB officer Tarique Sayeed Mohammad has given confessional statement on Narayan­ganj abduction and killing incident before the court on June 18, 2014. Tareque’s statement was recorded under section 164 of code of criminal procedure in the Jadge’s Chamber of Senior Judicial Magistrate KM Mohiuddin and send him to jail. Tareque Sayeed Mahammad was taken to police remanded for total 34 days in two cases of Naranganj abduction and killing of 7 people. 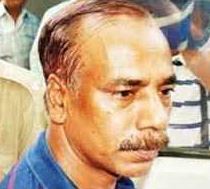 The main accused of the Narayan­ganj killing Nur Hossain was arrested in Kolkata and now on 8 days remand.